Following my retirement in 2013, I still had an interest in teaching, at least in terms of lecturing and discussing historical topics of interest to me. But I didn't want to do it every day, and I definitely didn't want to have to grade any more papers or exams, or deal with the departmental and committee meetings that accompany a regular academic position. Mickey and I also wanted to travel. So, following the example of a college classmate, as well as another professional colleague, I decided to look into the prospects of lecturing on cruise ships. That seemed to offer the best of both worlds. Although my major area of expertise is Northern Europe, I also had a minor field in Latin American History when I was in graduate school. Unfortunately, I never had an opportunity to put that to use--until 2014. Using that historical training, I've been able to lecture on two Caribbean cruises. 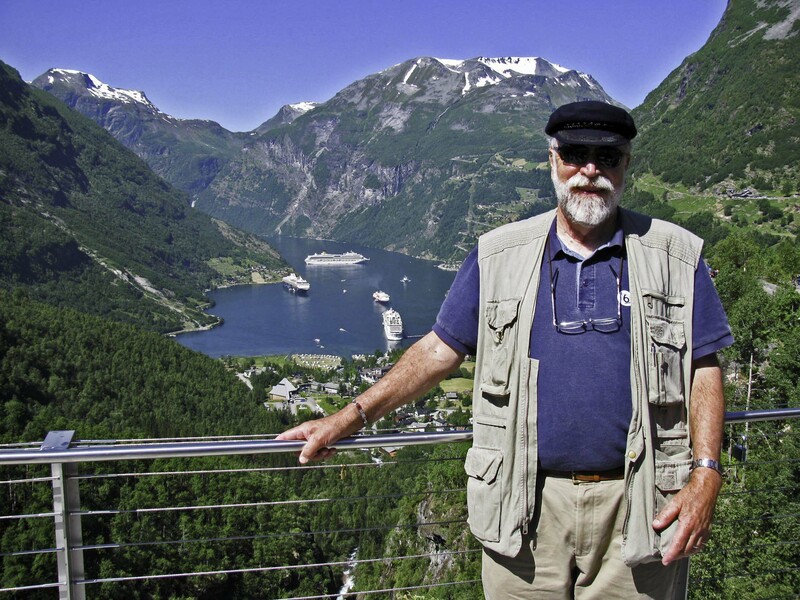 And with my major areas of specializaztion in Northern Europe, I've also spoken on nearly a dozen cruises in Scandinavia and the Baltic, and three transatlantic cruises (which combined my background in Northern Europe as well as Latin America--at least the Caribbean region). From 2014 to 2018, I lectured in the capacity of "Destination" or "Enrichment" Speaker. Beginning in 2019, I will be doing so (and also leading "Question and Answer Rountable Discussions") with Viking Ocean Cruises as a "Viking Resident Historan." "The Caribbean and the European Age of Discovery"
"San Juan and the Triangular Trade"
"St. Thomas, U.S. Virgin Islands, and The Danish Imperial Experience"
"Hispaniola: The Tale of Two Countries"
"The Golden Age of Caribbean Piracy"
"Velkommen til Norge (Welcome to Norway)"
"Ålesund: Art Nouveau City in the Land of the Vikings"
"North Cape, Sami, and the Land of the Midnight Sun: The World of the Arctic"
"Fjord Country, Land of the Vikings"
"Bergen through the Centuries: From Hanseatic Trade Center to Modern Cultural Hub"
"The Eastern Baltic: From the Viking Age to the EU"
"St. Petersburg: Russia's 'Window to the World"
"Empires in the Baltic: From the Vasas to the Romanovs"
"The World of the Vikings"
"Stavanger and Ålesund: From Viking Strongholds to North Sea Oil Centers"
"Geiranger: In the Heart of Fjord Country and the Land of the Vikings"
"St. Petersburg: Russia's 'Window to the World'"
"Cork: Ireland's Gateway to the Atlantic"
"Paris, Le Havre, and Portland: The Norman/English Connection"
"Klaksvik - Irish Monks, Sheep, and Viking Settlers: Settlement of the Faroes and North Atlantic Islands"
"Reykjavik: Capital of the Land of Fire and Ice"
"Viking Sailing Technology," "Viking Colonization in the North Atlantic: Greenland and North America"
"Gudrid the Far-Travelled: Viking Age Globetrotter"
"Halifax, Nova Scotia: Atlantic Canada's 'New Scotland'"
"Boston: Cod, Whales, and Lobsters - from Colonial Village to Modern Metropolis"
"Sugar, Slaves, and Pirates: The Development of Tortola and the British Virgin Islands"
"Empires in Conflict: St. Kitts and the British Colonial Presence in the Caribbean"
"Dominica, 'Nature Island of the Caribbean'"
"Antigua: Britain's 'Gateway to the Caribbean"
"St. Maarten and the Dutch Colonial Experience"
"The Caribbean and the European Age of Reconnaissance"
"Stavanger and Ålesund: North Sea Oil Centers at the Gateway to Norway's Sami Culture"
"Viking Expansion to England, Ireland, and the Islands of the North Atlantic"
"The European Age of Reconnaissance"
"The Western European Powers and the 'Golden Age of Piracy'"
"Ponta Delgada, Capital of the Azores: Portugal's Stepping Stones in the Atlantic"
"Le Havre, Normandy, and Paris: From the Midule Ages to the Present"
"Zeebrugge (Bruges and Brussels): Belgium's Prominence, from the Romans to the EU"
"Amsterdam: Cultural and Economic Hub of Northwestern Europe"
"Tallinn and the Eastern Baltic: From the Viking Age to the EU"
"Empires of the Baltic: From the Vasas to the Romanovs"
"The Age of the Vikings"
"The Southern Baltic: Germany and Poland Through the Ages"
"St. Petersburg: Peter the Great's 'Window to the World"
The Southern Baltic: Germany and Poland Through the Ages"